A&D Japan has released an Industry first for the Food Inspection sector. Until now, you could not use a regular metal detector to check packaged goods that contained Oxygen Absorption (OA) sachets. OA sachets are designed to remove Oxygen from within food packaging, enabling shelf life to be extended. These sachets contain metallic powder that reacts with and reduces Oxygen contained within the packaging. Due to their strong metallic signature however, having these OA sachets present means that traditional Metal Detectors cannot be used for final product inspection, other than as a QC point to actually check hat the OA sachet has been added to the product. If you wanted to check for metallic contamination, you would require an X-Ray machine or you would need to inspect the product before the OA sachet was inserted. For many manufacturers that are required to inspect the final packaged product, X-Ray has been the most popular solution but it is far more expensive than a electromagnetic metal detector, both in initial investment and ongoing maintenance. A&D stands for “Analog to Digital”. They are one of Japans leading measurement instrument manufacturers and are particularly well known for weighing systems and blood pressure monitoring technology. But it’s their world-leading Digital Signal Processing (DSP) technology that has led them to this latest innovation. With a unique micro analysis tool built into the software of their regular metal detectors, the sensor is able to differentiate between the distinct, strong signal created by the ferrous OA sachet, and those created by much smaller metallic contaminants that could be present in the same package. Other metal detectors struggle with this because the strong metallic signature of the OA sachet masks anything that generates a smaller signal as it passes through the sensor. If you understand photography then this is like being able to take a high resolution wide-angle shot with a telephoto zoom lens! That’s the kind of breakthrough we are talking about. So what this means to food manufacturers is that they now have a very cost-effective alternative to X-Ray Inspection. 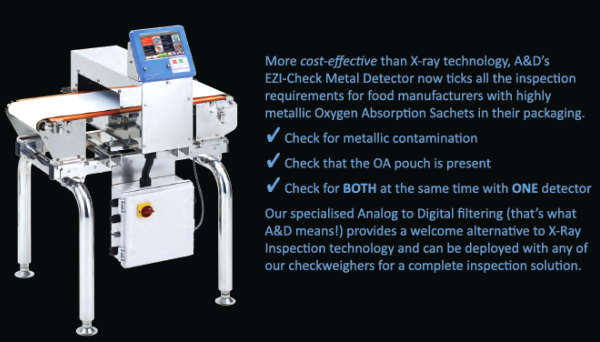 They can use an A&D Metal Detector to not only check for metallic contamination in their final product, but they can also get an alarm if the OA sachet is missing in the same pack, at the same time. This will revolutionise the way many manufacturers look at their inspection systems requirements and when combined with one of A&D’s Checkweighers, becomes the complete end-of-line inspection system. To discover our full range of inspection products, as well as many other weighing scales products and services, browse our website or contact us on 1800 241 343 today.